♥♥ Backdrops work great in Kids rooms to create their favorite scene. Please select the size you need from the drop-down menu. Once purchased, please include your PERSONALIZATION INFO in the notes to seller or GET it Blank with no writing. 2. Date of Event ➡️SUPER Important you include the date needed by. 3. The proof will be sent to you before printing. Please, check the shop announcement for most current processing times. ♣︎♣︎please remember that upgrading shipping does not cut the processing time. Sometimes I can reduce processing time by a couple of days, but contact me first to make sure. ♥Backdrop Material: Vinyl Backdrop can be used again and again. ●●●Grommets - Recommended if you are using command hooks to hang it on a wall or attaching to photo stand. 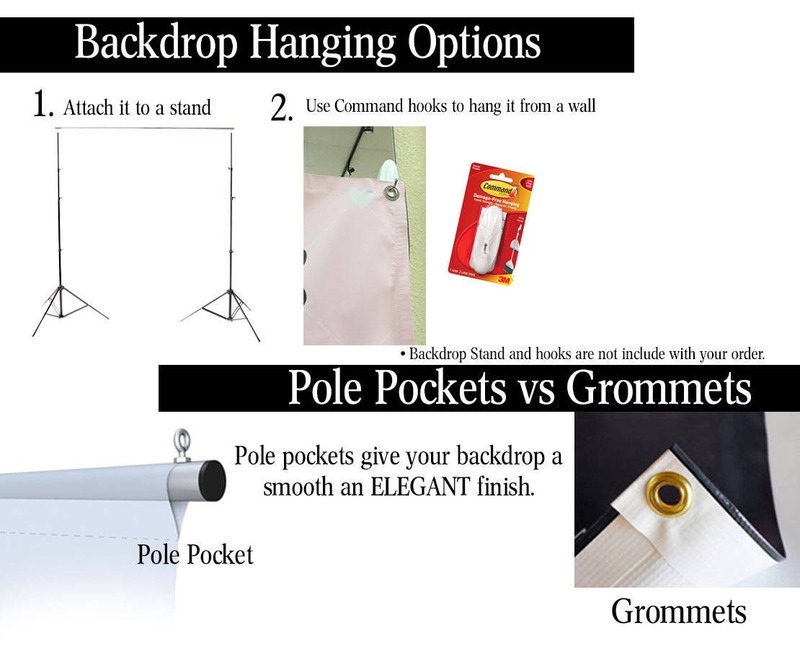 ●●●Pole Pockets - Recommended if you want a clean, elegant finish to your display. It will slide through the pole in your photo stand, or you can use command strips to hang it on a wall. ♥ Some items have elements that are designed to look like foil/glitter, but no foil/glitter will be printed on the sign. If you need a color change on this design, please purchase the following link. Please remember that every screen is different. Color may vary slightly due to Monitor/ Printer output. Please note that all samples in my shop are digitally created. I assemble samples to give ideas for use. If you would like to see actual setups. I have a few samples that you can see on my FB Page. We accept Paypal, direct checkout with credit cards and Etsy gift cards..
All orders take a minimum of 3-4 business days (Monday - Friday) to ship. We offer the following shipping methods. Fed Ex- 2nd Day For Welcome Signs Order should arrive in 2 business days. Fed Ex 1 Day Overnight for Backdrops Order should arrive in 1 business days. FED EX Saturday Delivery - Order shipped Overnight Friday will get to you Saturday. Keep in mind that upgrading the shipping does NOT cut the production time. If your event date is less than 5 business days away, a shipping upgrade is highly suggested. 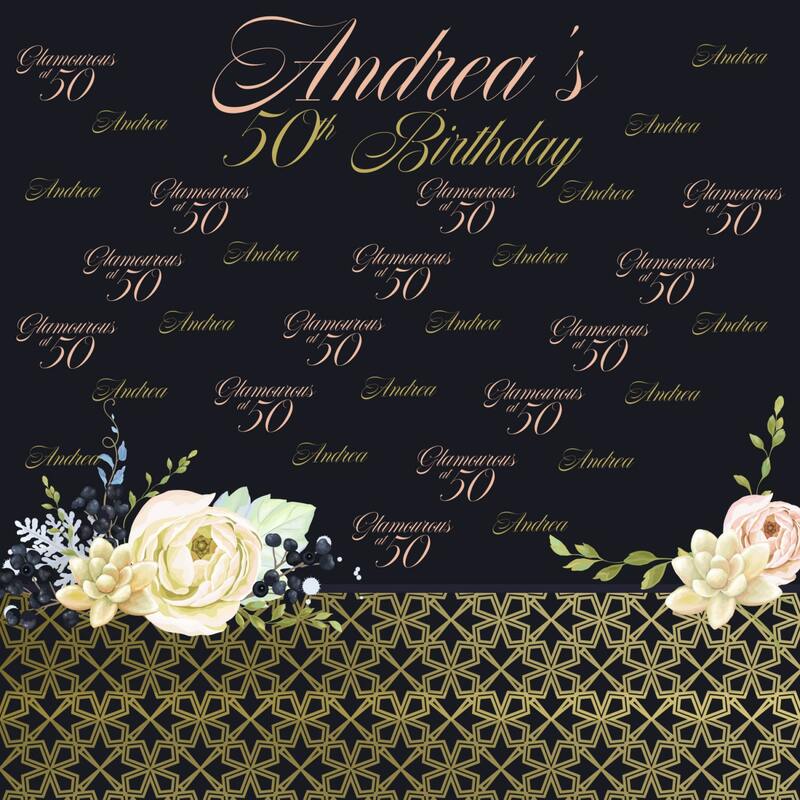 All Banners are custom made to order. Once a proof is sent or item mailed out no Refunds or Cancellations are made. Thank you for understanding. I try to pack every order securely, but sometimes damages do happen while shipping. Please contact me right away with your claim to be able to process your refund or replacement. You must provided a picture of your damage box and product. FED Ex is great at logging box damages in their shipping notes, so I can access those for my records to validate the claim. It is hard to match colors with what you see on your monitor to the actual banner. A slight difference will happen from time to time. Due to the color output of the printer vs. the calibration of your monitor/ phone screen. All items come with a proof approval. Proofs are sent via ETSY Convo Messages ONLY. Please READ carefully before approving your proof for print. It will help avoid any mistakes. 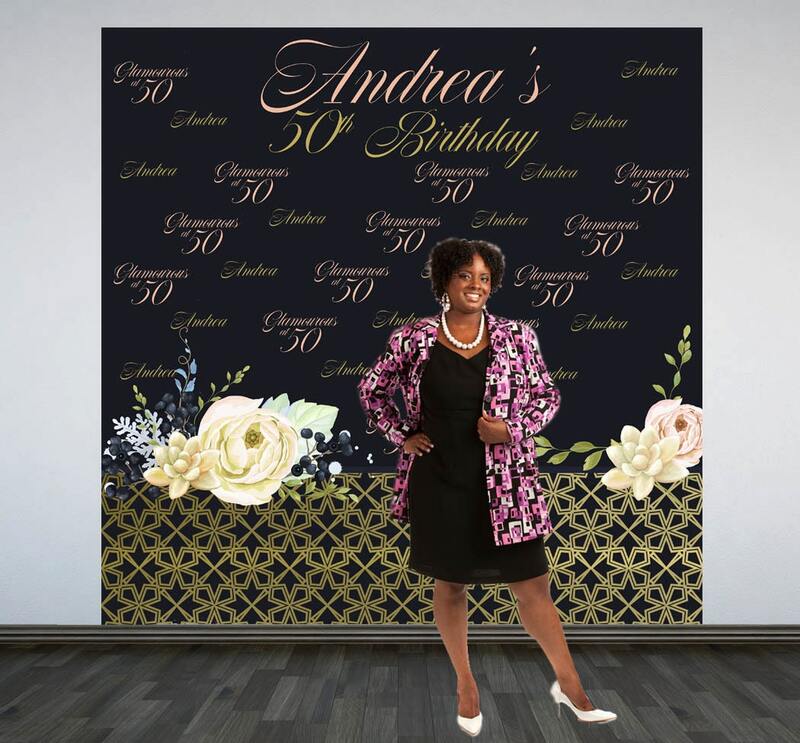 If your Backdrop/Banner has a mistake, but YOU approved the proof. It is your responsibility. 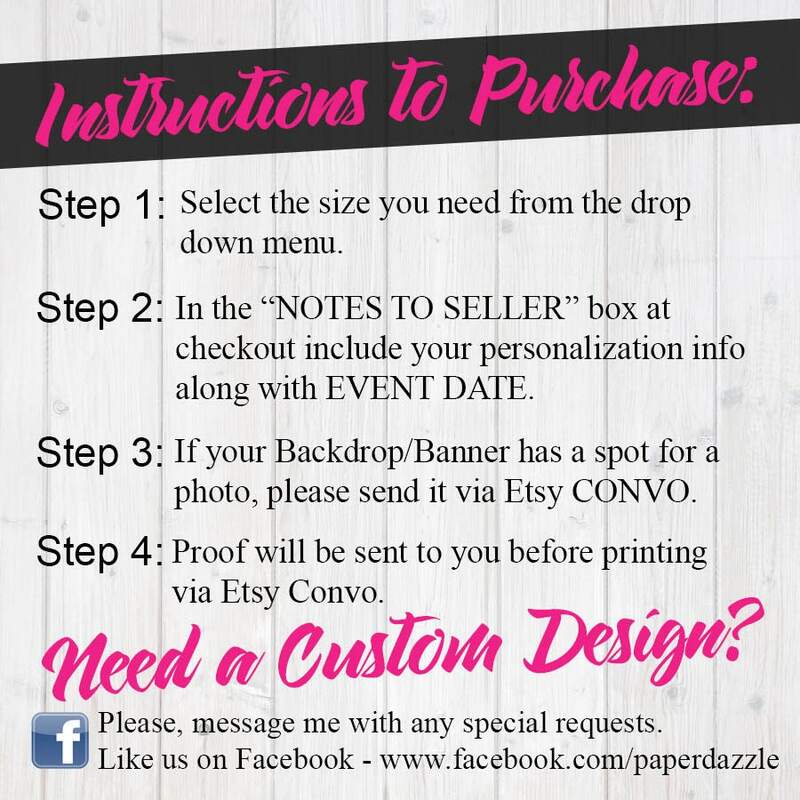 Banners/Backdrops are only printed with proof approval via ETSY Convo. Please make sure to check for any design/spelling mistakes. If you wish to reprint the item, you will be responsible for 100% of the cost. Please contact me within three days of receipt if you have any issues. Any claim over seven days of receipt will not be processed. Thank you for understating. Color may vary slightly due to Monitor/ Printer output. If you are trying to match an item or want to double check a color for any reason I will be happy to supply you with the RGB formula or If you have something you would like to match it to. Send me the RGB Code. In order to get a beautiful print on your banner. Your photo must meet the following requirements. 3. I don't remove backgrounds from Photos or edit photos. It's always best to send a picture of the person you want on the banner by themselves to avoid any delays. 4. NO Selfies please as the resolution is not of good quality. I love creating Special Designs, but please contact me first to make sure it's possible. It does take me a bit longer to create a new design. Once you place your order I can have a sample for you within 3 DAYS. Once you send me the specifications on what you need, I will create the first draft for you. You will get up to 2 more changes without any additional charges. Please try to be as detailed as possible to avoid any delays. Your purchase includes up to three revisions if you required more than three we do offer the option to purchase additional proofs for a small fee. • Wording and Text Color can be changed at no additional cost. • If you required background or image color change, contact me first to make sure is possible as there will be an additional $5to $10 fee for the change. What are grommets or pockets? Please view the 3rd picture in the listing to see a visual explanation. Please, include your personalization info in the notes to seller at checkout. A proof will be sent to you before printing. How long does it take to receive my item? Proofs take 2-3 days once you APPROVE to print your order production takes 2 days to go in the mail. Depending on where you are located it can take up to 5 business days to get to you.